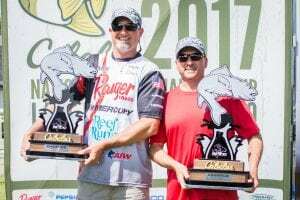 Lorain, Ohio—June 10, 2017—Ohio’s Sam Cappelli and Erick Williams rode a deadly near-shore trolling pattern like an elevator going up to win top honors and more than $165,000 in cash and prizes at the 2017 Cabela’s National Team Championship June 8-10 on Lake Erie out of Lorain, Ohio. 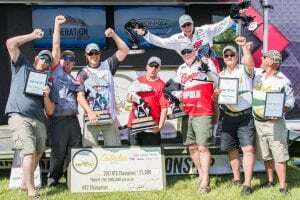 Presented by Cabela’s, the three-day championship featured 502 of North America’s finest walleye anglers competing in two-person teams that qualified for the event through local walleye tournaments organized by clubs and circuits sanctioned by The Walleye Federation. It was one of the largest stand-alone Cabela’s NTC fields ever assembled, and with more than $250,000 up for grabs, competition was fierce. 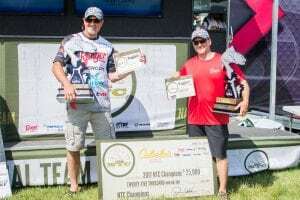 Their winning pattern was trolling deep-diving crankbaits 1.6 to 1.8 mph to tempt walleyes hugging bottom in 37 to 45 feet of water just 2½ to 3 miles out of Lorain. Three-ounce snapweights 125 feet behind their planer boards helped get their baits into the strike zone, they said. On day one, they brought a 41-pound, 10-ounce, 5-fish limit to the scale. The catch put them in eighth place. As it turned out, the lost opportunity didn’t hurt them. In fact, they actually moved up the ranks to third place, easily making the cut as the field was trimmed to the top 25 teams for the final day of competition. With the tournament on the line, they cranked up a 37-pound, 11-ounce limit on day three for a 107-pound, 3-ounce total weight and 10-pound margin of victory. Cappelli and Williams were handsomely rewarded for their efforts. 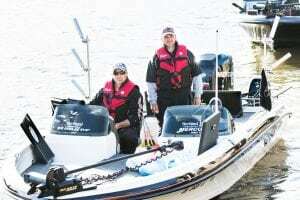 The team collected the $25,000 first-place cash paycheck, plus a brand-new Evinrude-powered Ranger boat rigged with a Power-Pole shallow-water anchor and drift paddle, valued at $70,095. They claimed a second Evinrude-powered Ranger with a Power-Pole shallow-water anchor and drift paddle for winning the Ranger Cup contingency, pushing their total winnings past $165,000. 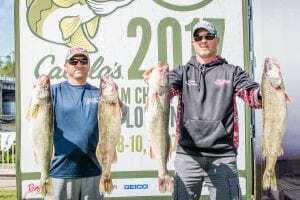 The 2017 event marked the 16th edition of the prestigious Cabela’s NTC championship, which annually draws hundreds of avid walleye anglers from across the U.S. and Canada. The Cabela’s NTC offers a lucrative payback of nearly 400 percent of entry fees. Teams shared more than $256,000 in cash and prizes, plus 50 custom Cabela’s All-American rings, trophies, plaques and more. Another $1,000 in Cabela’s gift cards were awarded for big fish and big basket honors. On day one, the $250 Ram Big Basket Award went to Dan Geiken and Brad Berens for their 44-pound, 1-ounce limit. Judson Ollinger and Jon Clarken earned the day one $250 Evinrude Big Fish Award for their 11-pound, 12-ounce walleye. 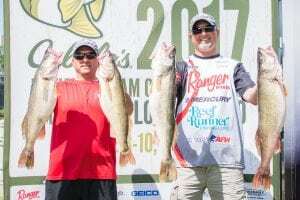 On day two, Maxwell Wilson and Chase Eberly won the $250 Ranger Boats Big Basket Award for their 45-pound, 3-ounce limit, while David Kolb and Ken Vermellen collected the $250 Pepsi Big Fish Award for an 11-pound, 4-ounce walleye. A total of 2,301 walleyes weighing 9,521 pounds, 7 ounces crossed the scale at Black River Landing during the championship. Adding to the excitement, the event was streamed live online at walleyefederation.com, and filmed for national television on “Americana Outdoors” on NBC Sports, the Pursuit Channel and other regional networks. Dates and airtimes will be announced at walleyefederation.com. 2017 Cabela’s NTC sponsors include; Cabela’s, Ranger Boats, Pepsi, Evinrude, Ram, Geico, Power-Pole, Lorain County, city of Lorain and Lorain Port Authority, and TWF. Based in Ponca City, Oklahoma, The Walleye Federation manages the qualifying process and co-produces the event alongside the Cabela’s Corporate Brand Partnership Team. Qualifying for the 2018 Cabela’s NTC on the Mississippi River at Moline, Illinois, is now under way. For details, visit walleyefederation.com, or call (580) 765-9031.